Why does breakfast at Lou Mitchell’s feel both familiar and special? When Uncle Lou’s father opened the restaurant in 1923, it was the first place in Chicago to serve breakfast all day. Many of the trademarks of the American Breakfast Diner were invented here, from serving eggs in skillets, to having eggs with Greek bread. 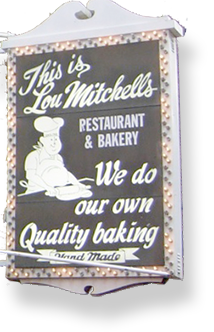 While other diners became commercialized and in many instances sacrificed quality for profits, Lou Mitchells has stayed true to its roots through five generations of family ownership. Our recipes are as delicious and authentic today as they were when we first opened over 90 years ago. Through dedication to fresh ingredients, excellent cooking, and good service, Lou Mitchell’s has been honored to receive many awards and mentions throughout the years, including the Golden Cup award, being featured in Zagat and TripAdvisor, and even receiving a Michelin rating. Our eggs are freshly delivered from local suppliers – we go through over 15,000 eggs in an average week. Our fries are fresh cut – never frozen, and fried in premium peanut oil for a golden-crisp finish. Our Tuesday & Thursday Turkey Dinners are made from whole-roasted fresh turkeys and real, fresh mashed potatoes. Together with the excellent food, what also keeps our customers coming back are the generous portions and fair prices. Why do we give free donut holes to each person who comes in to our restaurant? We love cooking and we love our customers. It’s a Greek tradition to offer a sweet treat to visitors in your home, and we feel that our customers are like our family, so we welcome you with donut holes. The recipe is based on old-fashioned cake donut mix, which is fried in premium peanut oil to seal in the moisture of the donut and deliver a crisp, brown exterior. First-time visitors might not know this, but part of what makes the toast so delicious is our home-made marmalade. We simmer honey, orange slices, spices, and fresh orange juice for hours to thicken it into a wonderful spread and the perfect complement for Greek toast. If you haven’t tried a real home-made marmalade before, please come! Many of our customers even order jars of the marmalade to-go so that they can enjoy it with their toast at home.